Relieved Grampian farmers have praised local gamekeepers for their assistance in the return of missing cattle that had been loose on the hills for five days. 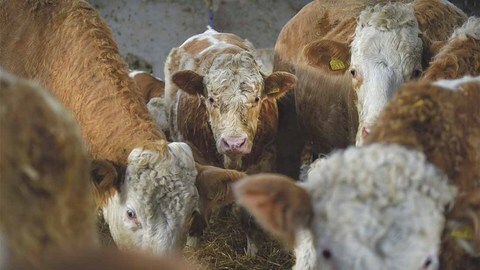 A valuable herd of 35 Simmental X Heifers belonging to tenant farmers, Lynne and John Gordon, broke out of an enclosure in the Forest of Birse area last Thursday, prompting the anxious couple to seek urgent help to find them. After posting on social media pages of Grampian Moorland Group, the well-travelled heifers were finally located late on Tuesday evening, by gamekeepers, near Glen Esk, where they were successfully guided back to the farm in darkness. "We are so relieved to have the herd back. They’ve covered quite a distance. It has been a nightmare and a lot of worry," said Lynne Gordon. The Gordons went on to praise local gamekeepers who patrolled the hills on quadbikes to hunt down the missing cattle. Lynne states: “Without the gamekeepers from Ballogie and Finzean Estates, I doubt if we would have managed to get them back”. All of the animals were checked over yesterday and given the all clear, much to the relief of the Gordons.